Astronomers have for the first time discovered a pair of supermassive black holes that orbit each other in an ordinary galaxy. At the heart of most galaxies, there lies a supermassive black hole – as you probably already figured out from the name, it’s like a normal black hole, but much bigger. But two supermassive black holes? 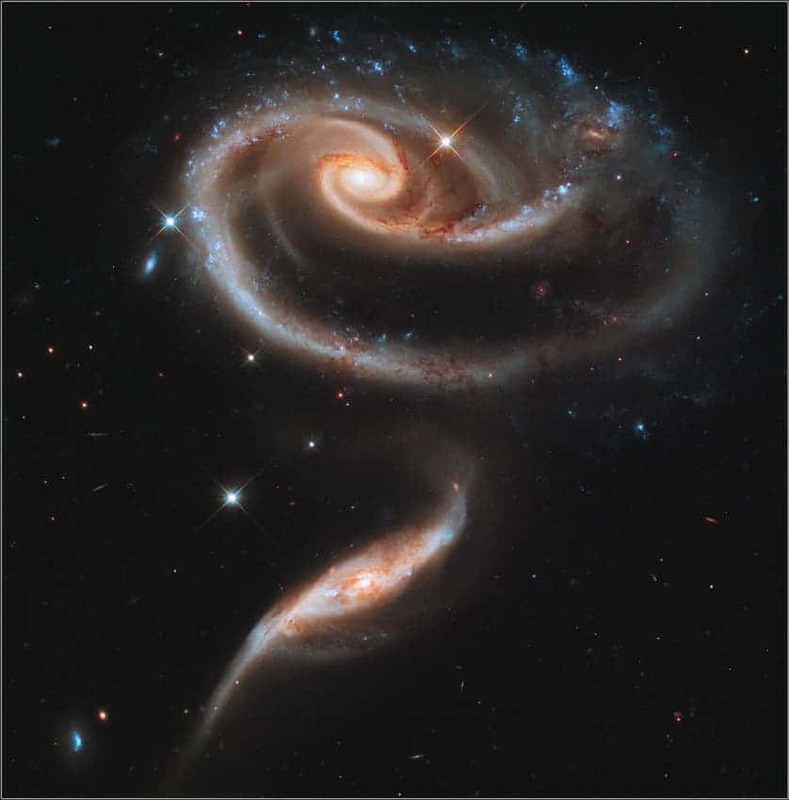 That’s a smoking gun – a clear indication that the galaxy in which they are located is in fact the result of a collision between two galaxies. As you might guess, these collisions are not particularly frequent. Up to date, only a few candidates for such binary black hole systems have been located, by studying X-rays emitted by the galaxies’ centers. In the process of galactic collision, the gas is heated so much that it shines at many wavelengths, including X-rays. This gives the galaxy an unusually bright center, and leads to it being called active. Four years ago, on June 2010, Dr Fukun Liu from Peking University in China with colleagues spotted a tidal disruption event in the galaxy SDSS J120136.02+300305.5 (J120136 for short). They were specifically looking for this kind of events, and, lo and behold, they got lucky. The galaxy they were looking at was spilling massive amounts of X-rays, which they detected. 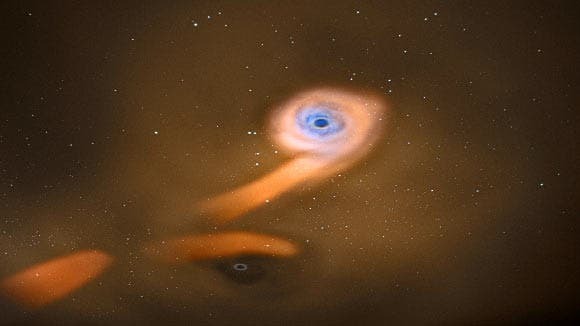 It looked exactly like the signature of a supermassive black hole, but as they continued to track it, they noticed something strange – the intensity was dropping more and more. After 48 days, they started reemerging, just as if nothing happened. “This is exactly what you would expect from a pair of supermassive black holes orbiting one another,” said Dr Liu, who is the lead author of the study published in the Astrophysical Journal (also on arXiv.org). They constructed models to see what the possible configurations are, and they found that there are two possible solutions to this system: either the primary black hole “weighs” 10 million solar masses and is orbited by a black hole of about a million solar masses in an elliptical orbit, or the primary black hole is about a million solar masses and is orbited in a circular orbit. In either case, the distance between the two holes is really small – comparable to our solar system. Judging by this small distance, it’s very likely that the two will merge sooner or later. What happens when two supermassive black holes collide? Well, to cut a long story short, you end up with one, super supermassive black hole. This study could provide valuable information about the way galaxies merge, and what is left in the aftermath. “Once we have detected thousands of tidal disruption events, we can begin to extract reliable statistics about the rate at which galaxies merge,” said study co-author Dr Stefanie Komossa of the Max-Planck-Institut für Radioastronomie in Bonn, Germany.